NotoriousOnline.org - Unofficial Notorious BIG website - City Council approves street naming after Notorious B.I.G. In one of its final acts of 2018, the New York City Council unanimously voted to name two streets after some of the city's most legendary offspring: The Notorious B.I.G. (who was born Christopher Wallace) and Wu-Tang Clan. Pending Mayor Bill de Blasio's signature, Christopher Wallace Way would be located in Brooklyn and the Wu-Tang Clan District would be in Staten Island. The two naming initiatives were among dozens the council approved on Dec. 20, which also included streets to honor singer Woody Guthrie and poet Audre Lorde. LeRoy McCarthy, a longtime New York City resident, led the naming effort to recognize the Notorious B.I.G., who died in 1997, and Wu-Tang Clan. 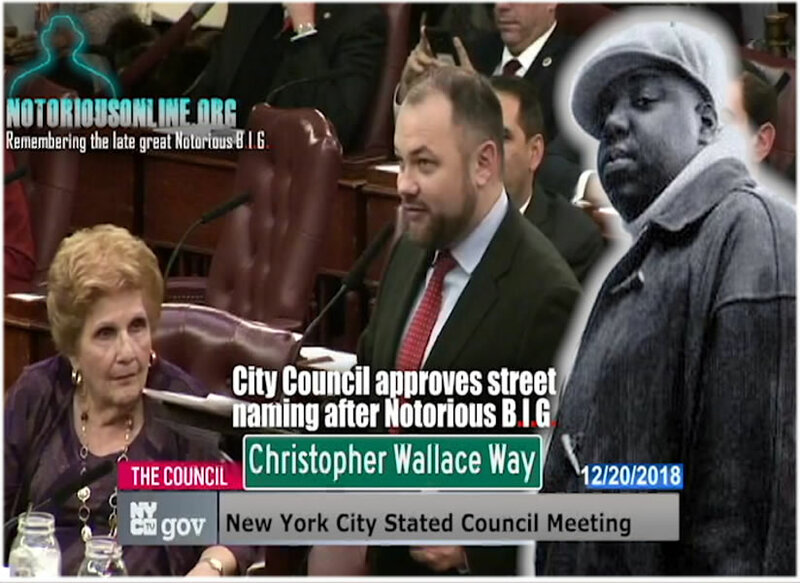 He tells NPR's Morning Edition he was inspired after reading a book on Wallace's life and in 2013, began trying to convince city officials to create Christopher Wallace Way. Official government recognition for hip-hop's greats is long overdue, McCarthy says. "There's a certain sense of dismissal for hip hop historically... they think it's not worthy of being recognized of the recognition that you would give to classical music or jazz or rock and roll," McCarthy says. "Hip-hop deserves that respect." This isn't McCarthy's first time pushing for recognition of hip-hop in public space. He also led the naming of Sylvia Robinson Place in New Jersey, which is dedicated to the founder of Sugar Hill Records, as well as Malik "Phife Dawg" Taylor Way in New York, which recognizes the late member of a Tribe Called Quest. Derek Alderman, professor of geography at the University of Tennessee, says that McCarthy's campaign — and street naming more broadly — shapes the collective memory of a city's past. Alderman notes that public space throughout history has predominantly been named after white men, and that the addition of Christopher Wallace Way and Wu-Tang Clan District is a step toward a more inclusive cultural geography. He says he hopes that young people in New York — he calls them the "hip-hop generation" — see themselves when they walk down the newly named roads. "[I hope] people take pride in it and feel a sense of community and a part of themselves seeing these street signs up," he says. "Just because you're not the A+ student or a doctor or lawyer doesn't mean you can't feel proud of where you come from and see someone who looks like you honored in this way."